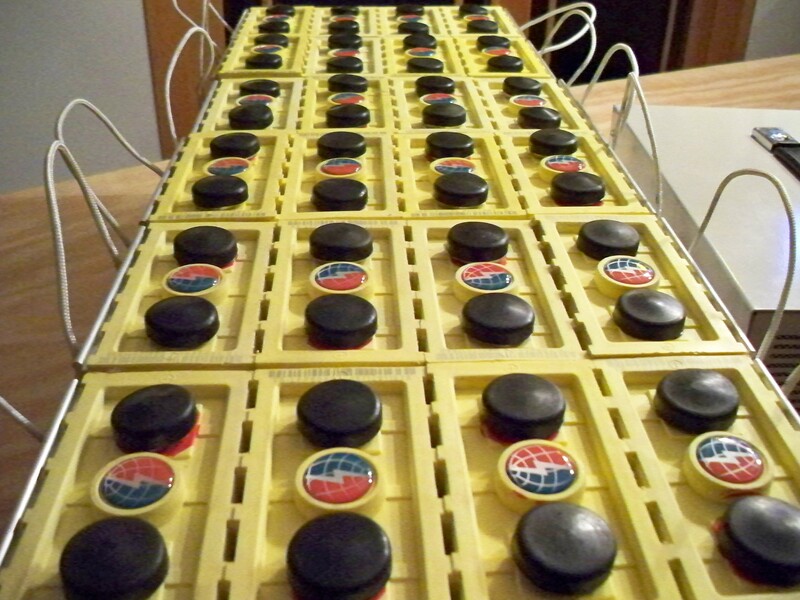 I finally got around to wiring up each on the individual 24 battery cells to make one mega battery pack. 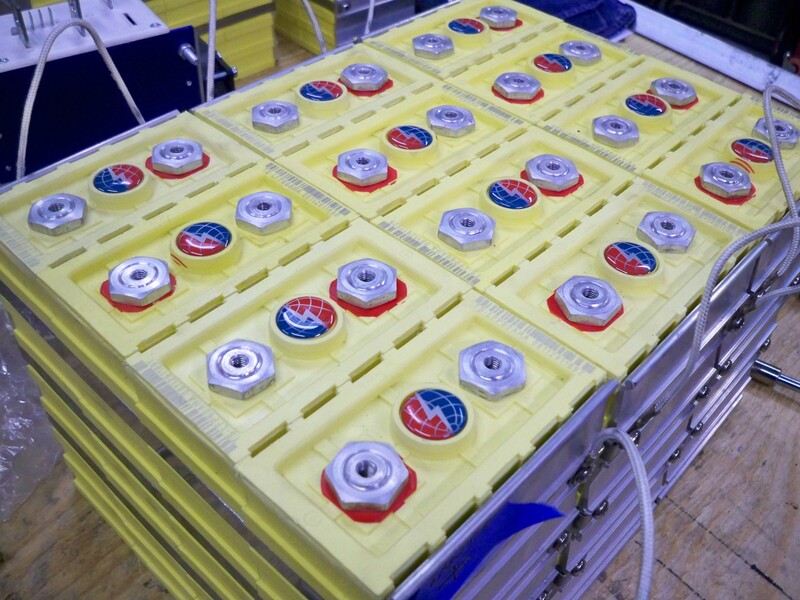 When wiring such a large battery pack together there are some Major safety and other considerations to take while assembling the pack. -Always be conscious that the cell terminals are exposed, and if a wrench is dropped or anything conductive it WILL ARC! this could electrocute you and damage your expensive battery pack! 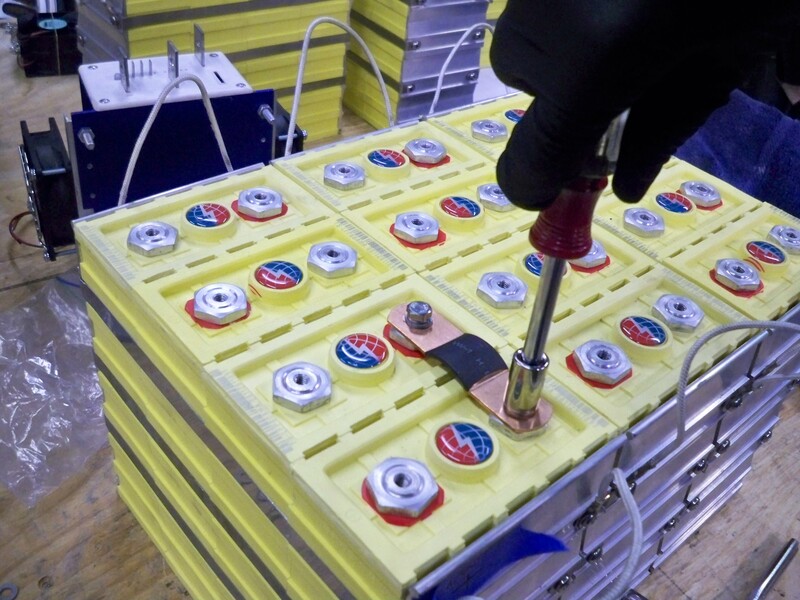 -Keep in mind that even if you are confident that the pack is being assembled correctly, always keep checking it with a volt-meter to ensure a cell was not installed backwards, or to help identify any “bad” cells during assembly. 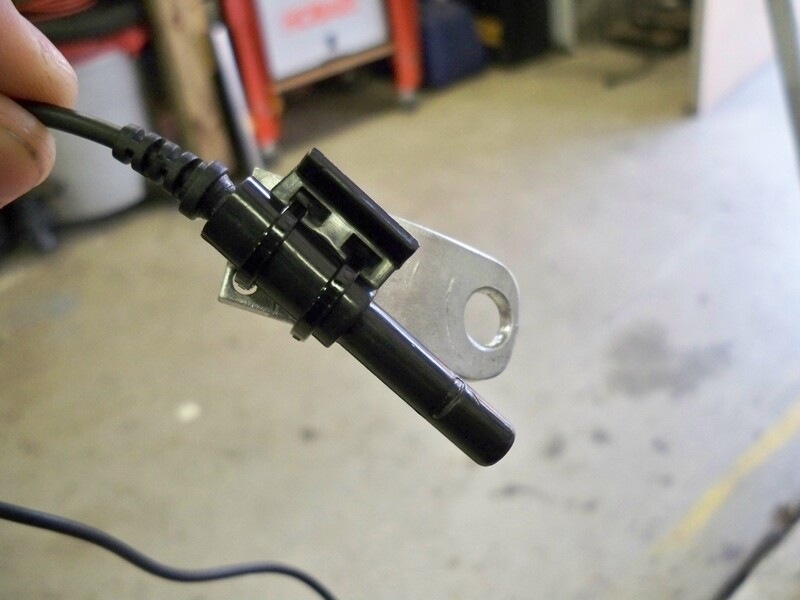 -Keep the “ground” (-negative) terminal disconnected from the frame of the vehicle, this will help prevent accidental arcing from tools or falling parts/wires. -I also highly recommend wearing gloves when connecting the larger voltages, this is always an easy way to protect yourself from accidental injury. Enough with guidelines, lets get building. I started by marking where the best location for my “master positive” and “master negative” terminals should be, after finding where these need to be I started assembling the pack around where these terminals had to end up. Using the “battery bridges” supplied by Elite Power Solutions I then started making secure connections. 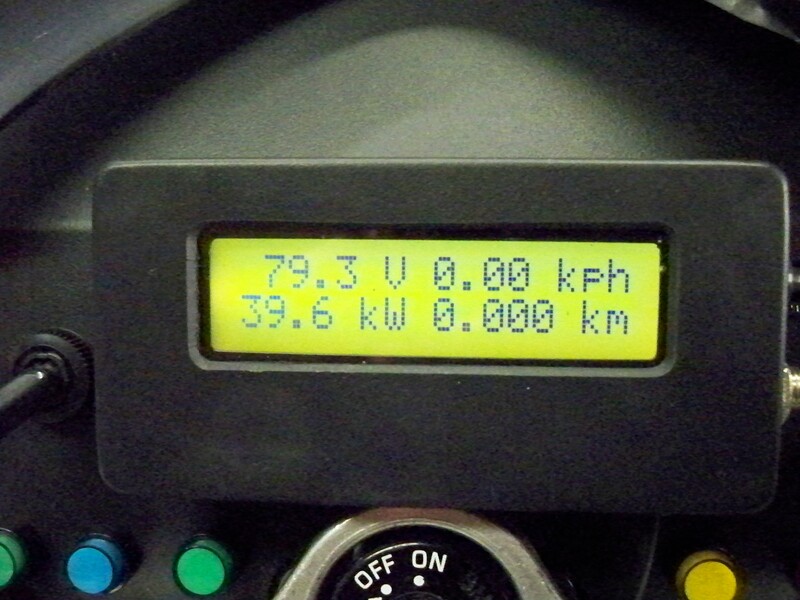 Like stated above, keep checking the pack voltage to ensure proper installation. 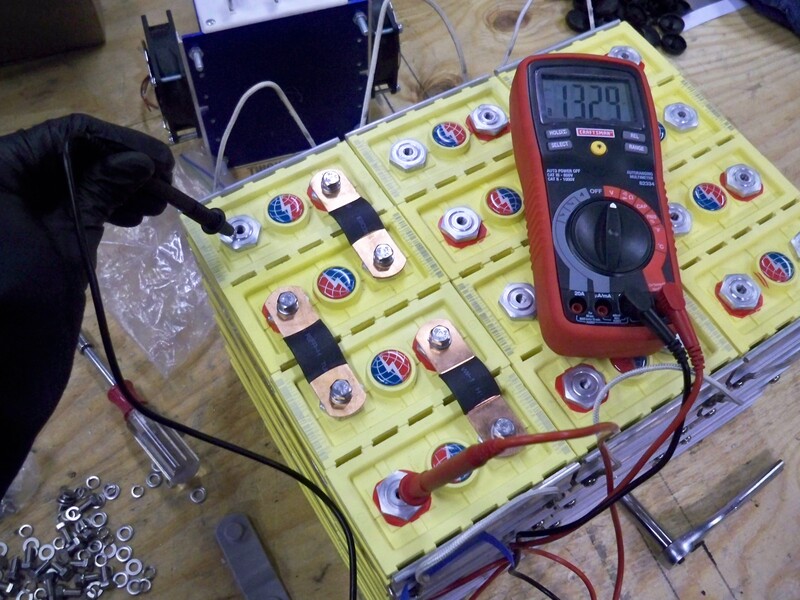 Each individual cell measured at 3.3 volts therefore I can use simple addition to keep track of the total voltage. Only so many connections could be made outside the bike, I then installed all the cells in the battery rack. after doing so I found that 3 jump wires needed to be made from 2 packs and from the upper and lower pack. These were made using a super-conductive #4 gauge wire, the wire was covered in wire loom and shrink-wrapped to prevent any type of short. Once the entire pack was wired up, I couldn’t resist to quick wire in my Cycle Analyst. the pack voltage is shown on screen and the back lighting works great, cant wait to see this thing in action. Waiting for the speed controller to arrive, I will post once that arrives and gets installed. One of my favorate parts of building EV’s is installing the batteries, its like giving the “All Spark” to the first Transformer robot. 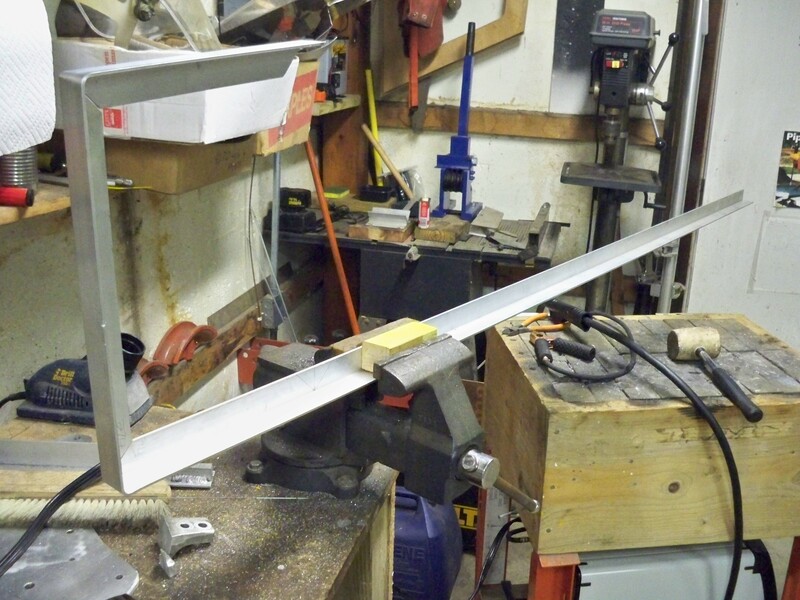 The first step is rather joyful, using a saw-zaw I removed the entire stock engine cradle/sub frame. This consisted of 2 bent square stock aluminum pieces that held the engine and transmission under the bike. 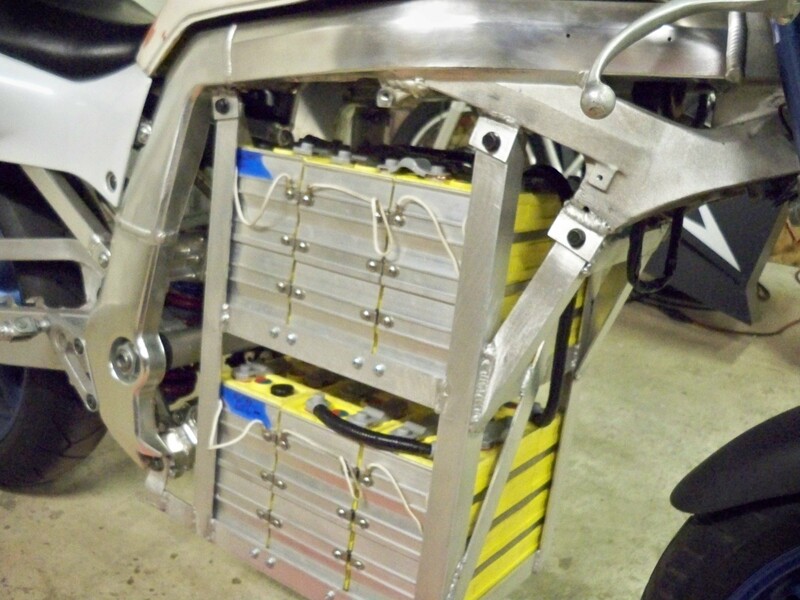 Since this motorcycle is being made for maximum performance, and needs to have every possible ounce of weight eliminated I decided to use Aluminum “L” channel to produce my battery rack from. 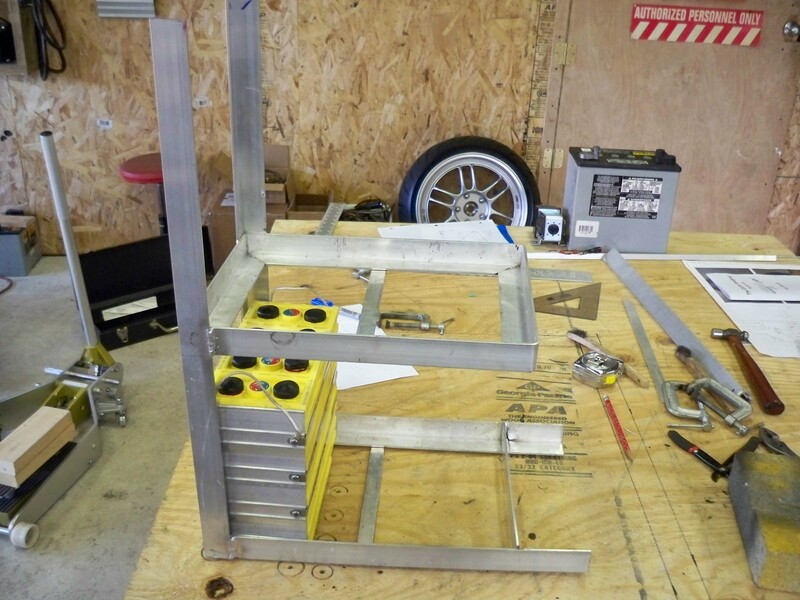 The aluminum battery rack was not inexpensive by any means, although the weight savings will be astonishing. I started by measuring that 12 of the cells (3 packs of 4 individual cells) would fit nicely on the top and 12 more would sit right below where the existing drive train was. 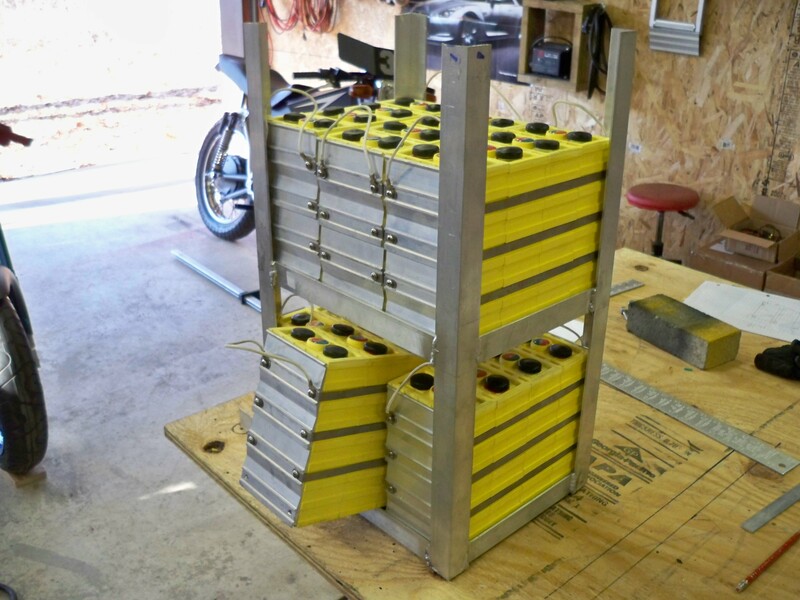 After carefully measuring all of the areas around the batteries I started constructing the 2 “battery baskets” which is basically “L” channel folded and welded around to hold the batteries in place. After both “battery baskets” were constructed I measured and started making the corner towers. 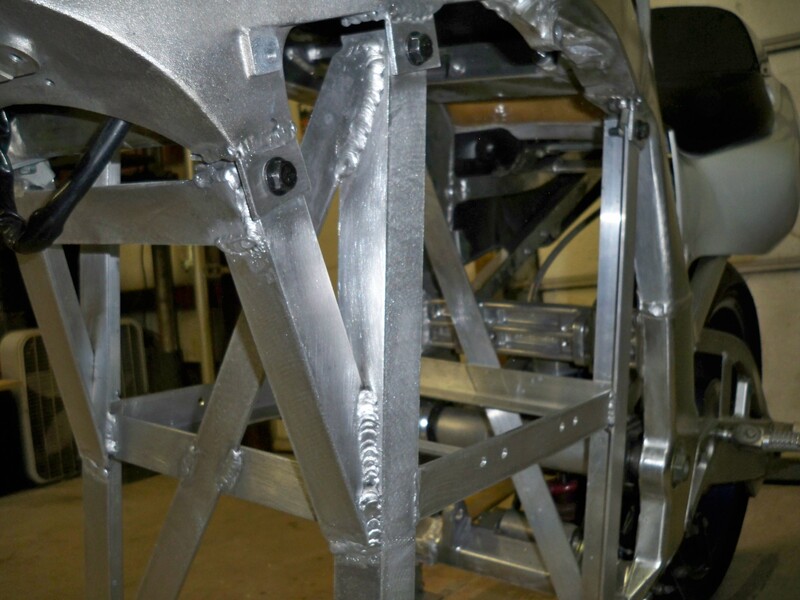 These will hold one basket on top of the other and also provide means of mounting the entire assembly to the motorcycle frame. 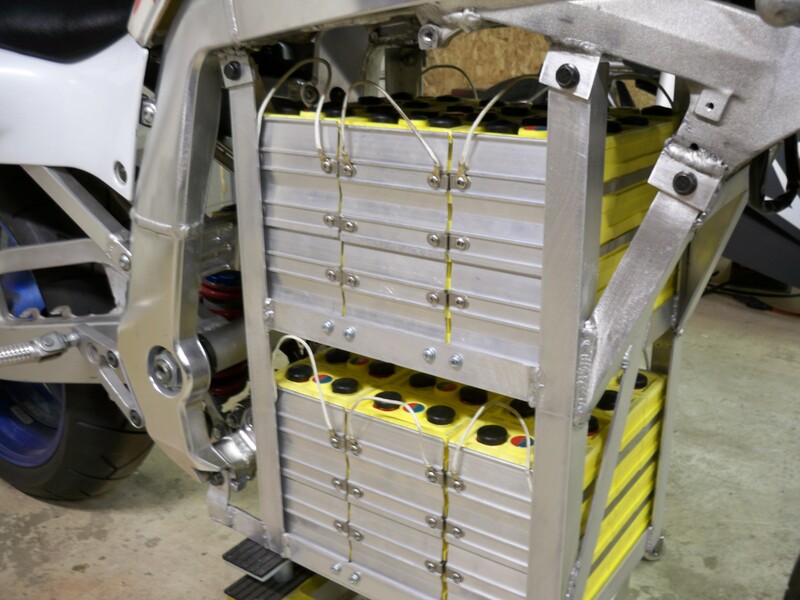 Whenever constructing a battery rack for an EV its important to remember the obvious, how are the batteries going to be installed and removed. Well in my case the center battery tilts upward and pulls out, then the other two slide to the center and tilt out as well. 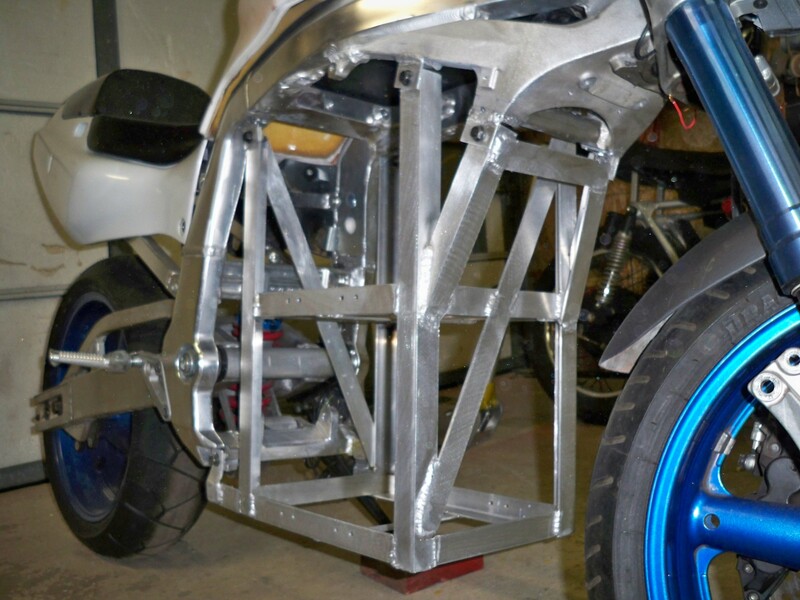 Once the entire battery rack is constructed it’s time to measure and install brackets to hold the entire fixture on the motorcycle frame. 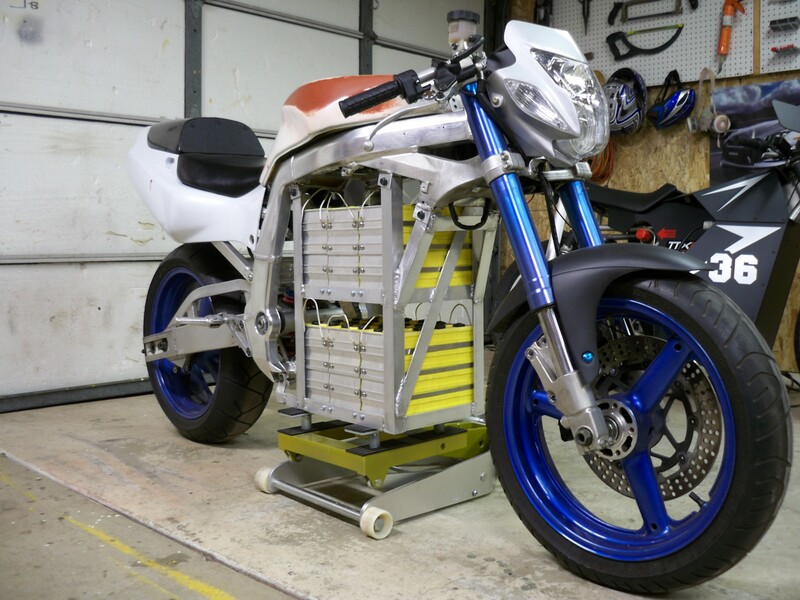 These connections need to be made very securely for many reasons, the 120lb battery pack is big, and needs to withstand the harsh conditions of racing. 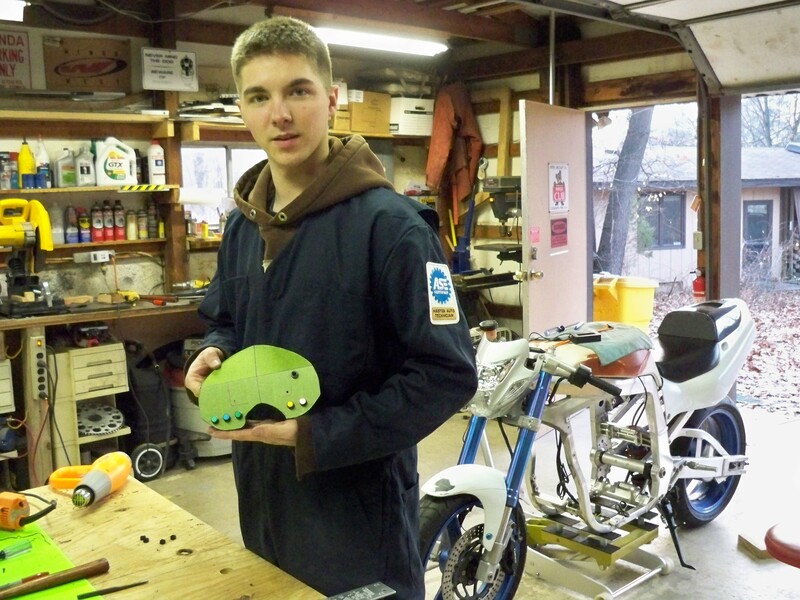 The batteries need to be able to withstand an accident if the bike were ever tipped over. 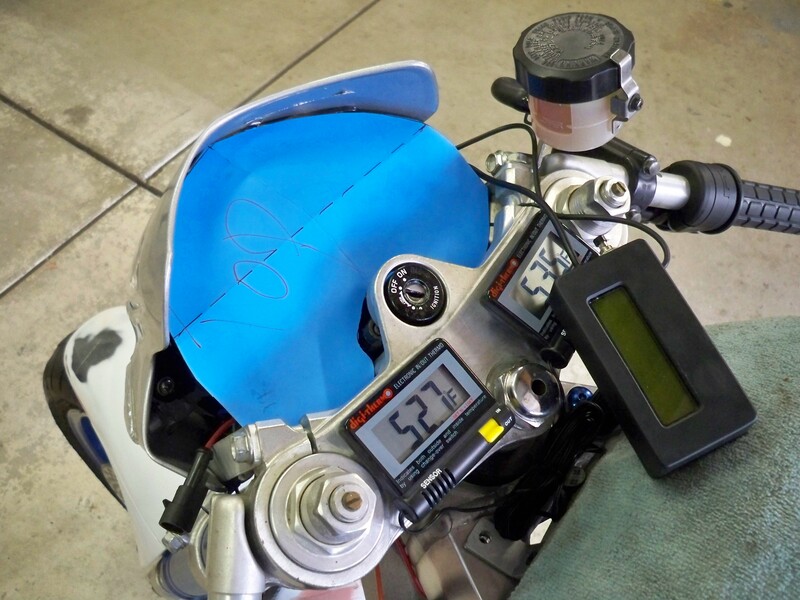 And lastly this will be the new jack pad for the motorcycle, so it must support the entire weight of the bike. 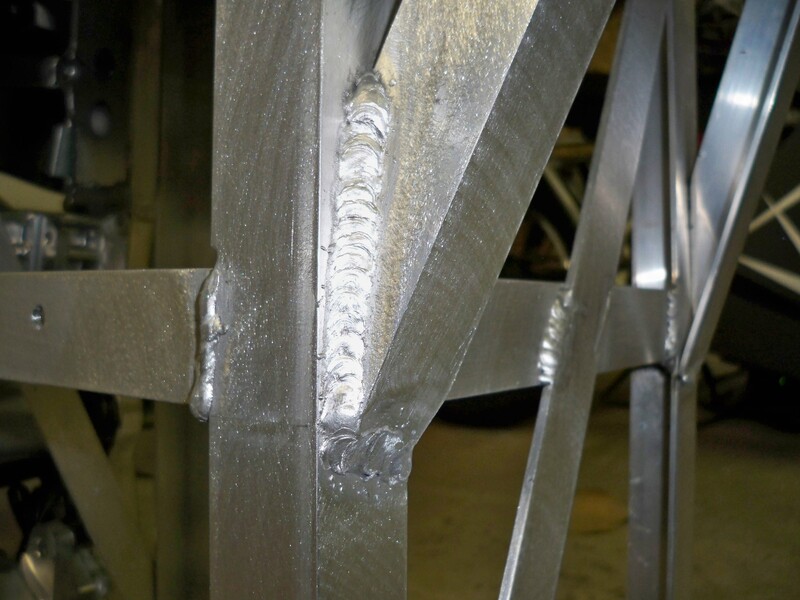 Quality aluminum welds are important when working with such a soft and lightweight material. 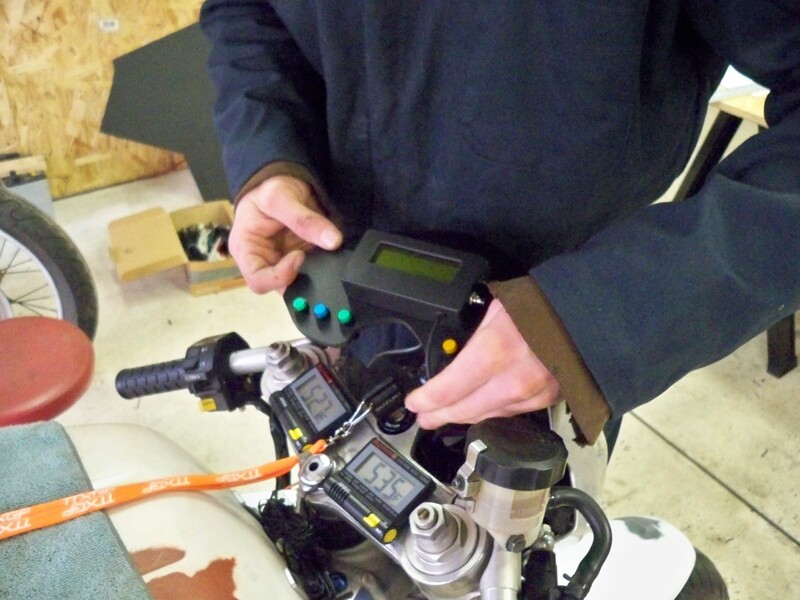 Before you know it, the batteries are safely and securely installed. Its also important to note that I left about 2.5″ of space between the battery terminals and up. This was done because in order to install or remove any cell pack (4 individual cells) I will need to disconnect two of the terminals. therefore this space allows for ample hand and wrench space. Also note in the picture above that the screws in the “L” channel are actually the hold down screws for the packs. I removed the bottom 2 from each pack, this allowed me to drill holes where these screws go and re-install longer screws through the aluminum. This keeps the batteries from moving around and also prevents them from falling out if the bike becomes inverted. The jack is still able of holding the entire bike weight under the battery rack. 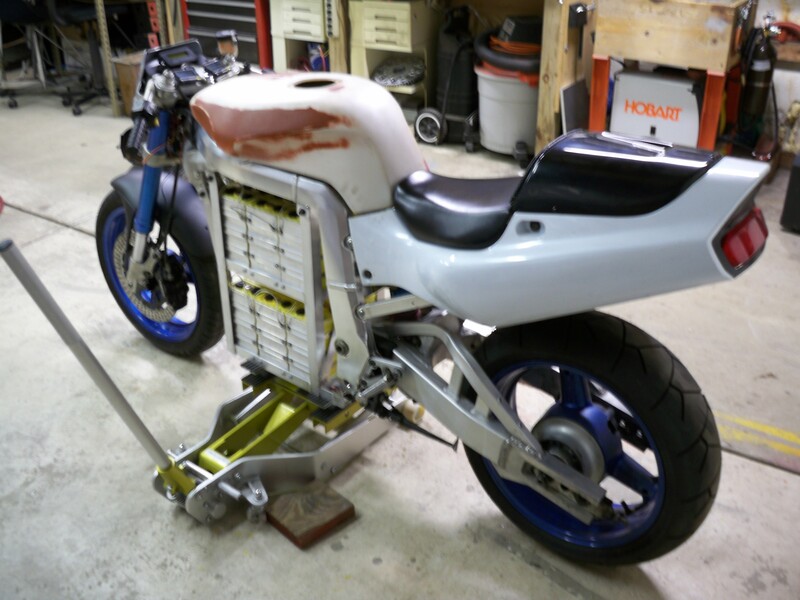 The battery being the main weight of the motorcycle I placed it dead center and directly where the mass of weight was before to help handling and braking characteristics, especially important during racing. This bike is finally starting to look good again! 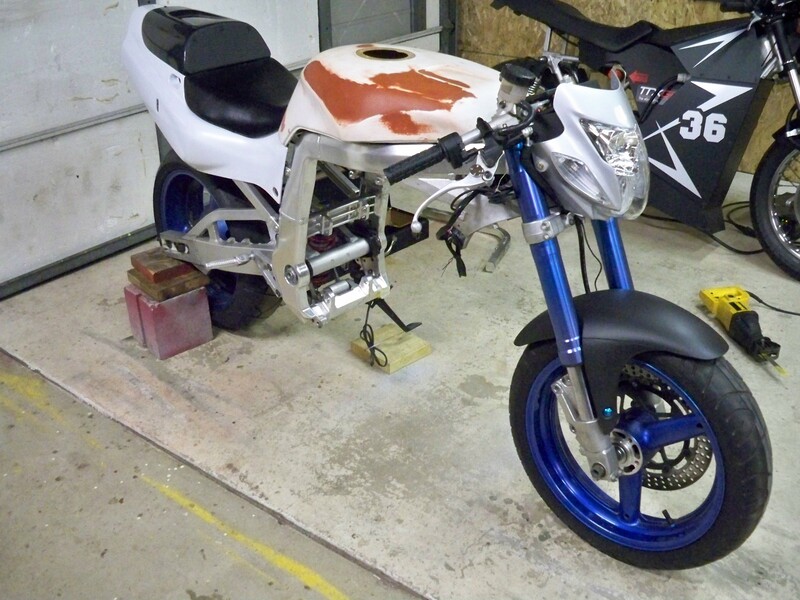 GSXR TTXGP Race Bike Sponsored! After contacting many companies that carry various Electric vehicle parts, only few responded. 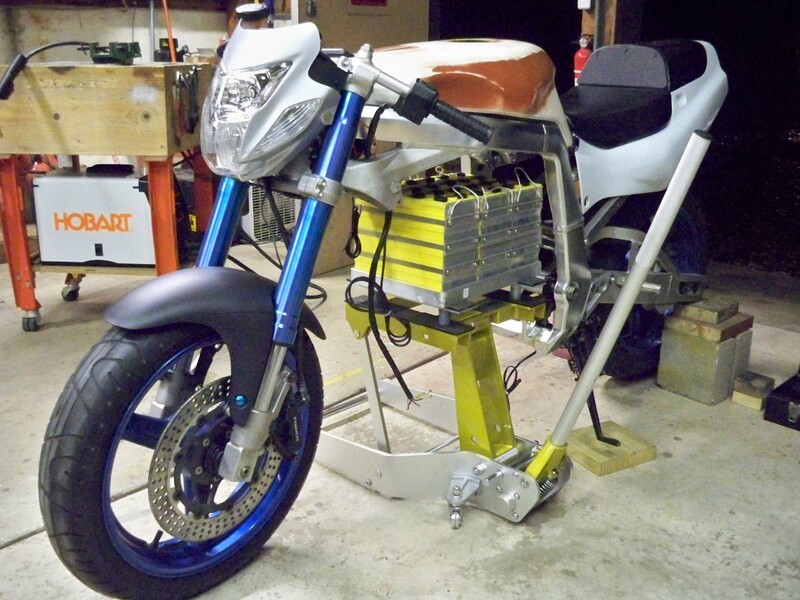 One in particular wanted to give me a deeply discounted Lithium Iron Phosphate (LiFePo) battery pack, Elite Power Solutions has supplied me with the high capacity light weight battery cells and charger I need to achieve top performance from the motorcycle. In return I will be proudly displaying their logo and name on both sides of the motorcycle, along with there logo on the tail. There generosity and helpfulness thus far has proven Elite Power to be a great company to work with. I recommend anyone looking for Lithium batteries to choose Elite power as you’re first stop. 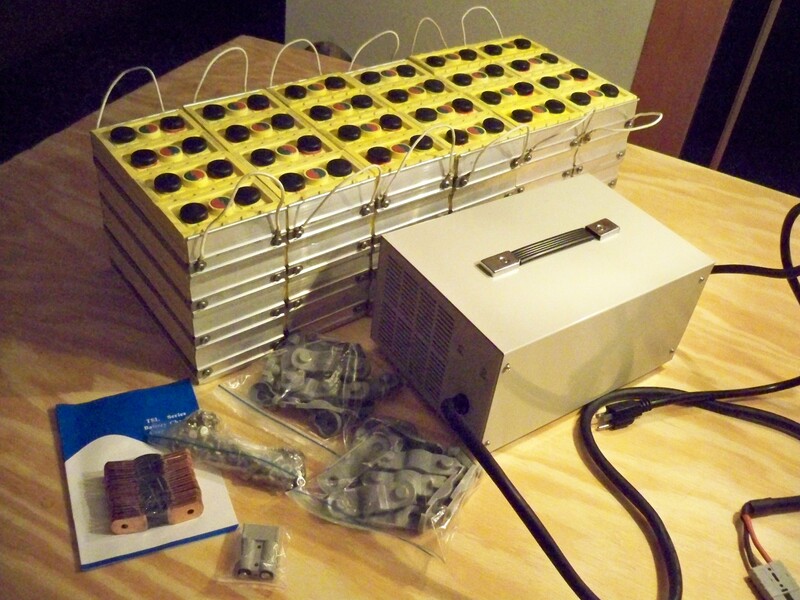 The 24 cell, 72 volt, 60AH pack, with charger, battery covers, and battery terminal bridges. After receiving my new “Cycle analyst” I had to start building my new fully digital dash for the bike. To start I used cardboard to make a template of the plastic sintra material needed. I now had to mount the speed sensor to the front fork of the bike to pick up a small rotating magnet to calculate vehicle speed. The magnet was placed on the inside of the brake rotor and the sensor tucked under the front fender, I then ran the wiring up the brake hose to the cycle analyst. In order to keep the plastic sintra dash looking good after lots of cutting, drilling, and sanding I used wide masking tape to cover the piece while doing all these operations. You can even heat bend the part with the masking tape still applied. After attaching the cycle analyst, indicator lights, switches, and running the lights its finally time to place the dash in and make brackets to hold it in place. Well my time spent definatly paid off, the dash loks awesome, the cycle analyst points right at the rider’s face for low glare and easy viewing. The sintra board has no scratches and fits perfectly. The indicator lights fit right where I wanted them. Two thermometers- one for motor temperature, one for speed controller temperature. 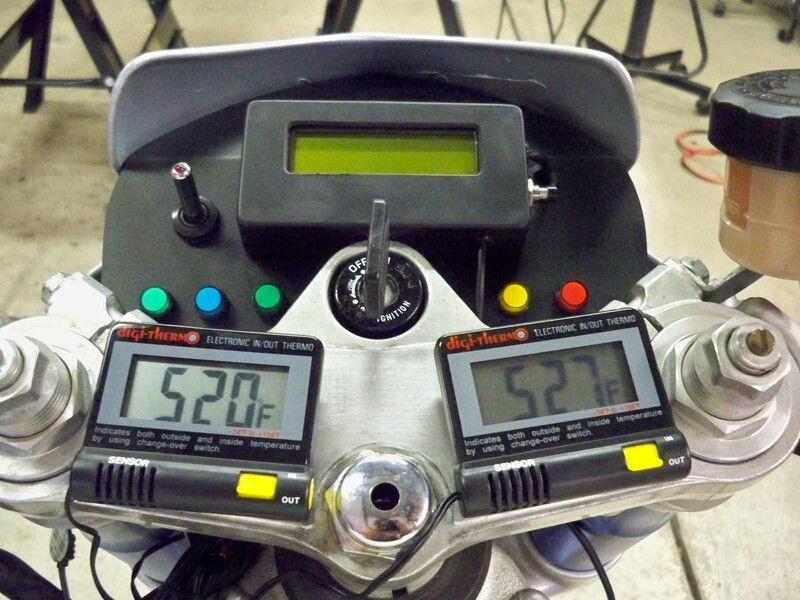 NOTE: the thermometers are only attached with velcro, and the wires now use small plugs to attach, these will only be used during testing, and racing. There not waterproof so I would not recommend using them as an every day gauge.